I’ve been warning you since 2008 that Barack Obama was no friend to Israel, yet you liberal Jews continue to support him blindly. Are you the same docile lambs who accepted the wearing of yellow Stars of David on your clothes, or Kristallnacht in 1938 Germany? Despite the strong words of rebuke from Israeli Prime Minister Benjamin Netanyahu on Friday, rebuffing Obama’s naiveté, in his dangerous statement that Israel go back to the borders before 1967; liberal Jews have been silent. In 2008, Obama won nearly 78 percent of the Jewish vote; just 21 percent went for his Republican rival, John McCain. Jewish voters remain a crucial part of his political base not only in votes but in campaign contributions as well. That’s why Penny Pritzker, was Obama’s 2008 national finance chairwoman and a member of one of the country’s wealthiest Jewish American business families. Obama’s anti-Israeli views have been apparent for quite some time. Sitting for 20 years in the pews of Reverend Jeremiah Wright’s church and listening to those Jew-hating, America-bashing speeches must have some effect. His friendship with Rashid Khalidi, a terrorism apologist and big Palestinian supporter goes back to 2003. Since becoming President, Obama has been extremely critical of Israel and then rolls all that back when speaking before AIPAC, even getting standing ovations from this ultra liberal Jewish crowd. What fools. Obama’s Mid-East team of advisers is full of Jew-hating, Israeli bashing creeps. Zbigniew Brzezinski in 2009, gave an interview to The Daily Beast in which he suggested President Obama should make it clear to Israel that if they attempt to attack Iran’s nuclear weapons sites the U.S. Air Force will stop them. Robert Malley, a Middle East expert, quit as an Obama adviser in late 2008, after it emerged that he was talking to Hamas, the militant Palestinian group, as part of his work for the International Crisis Group. Susan Rice, current ambassador to the U.N., was the foreign policy advisor to the ill-fated John Kerry presidential campaign in 2004, where she concocted the idea of solving the Middle East problem by appointing none other than Jimmy Carter and James Baker as negotiators. Rice has also advocated ending all U.S. military aid to Israel. I’ve always thought that Barack Obama would be a Jimmy Carter redux, but his speech Thursday on the Mid-East, has reaffirmed my conviction. Obama will keep pushing for Israel to accept a fallback to the pre-1967 borders. He has held this view since early in his campaign for President. 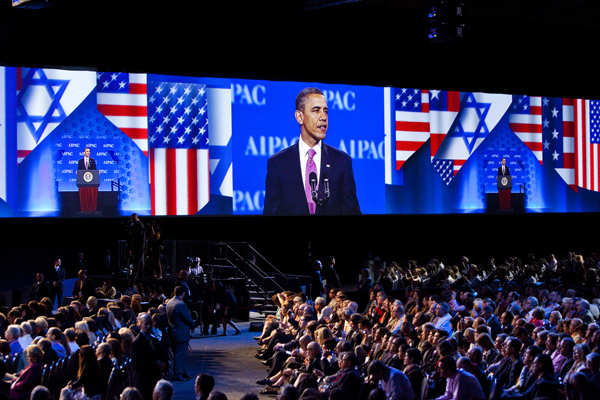 Today, at AIPAC, Barack Obama tried to change the meaning of what he said. In his speech today, Obama moved the goal posts, “…my reference to the 1967 lines — with mutually agreed swaps — that received the lion’s share of the attention, including just now. And since my position has been misrepresented several times, let me reaffirm what “1967 lines with mutually agreed swaps” means. I implore all you Hollywood “millionaires and billionaires” to stop supporting Barack Obama and the Democratic party’s campaign funding. You liberals in Chicago, New York, Boston, and San Francisco stop contributing to this Israeli-hater. Liberal Jews of America stop your stupid support of the Democratic Party. I’m completely befuddled by any Jewish support for this president. It’s blatantly clear that he does not support or even care about Israel. His behavior and speech was a total slap in the face. I’m infuriated by it. It’s completely unacceptable. That alone is enough reason to boot him out of the White House. It’s time the liberals in the Jewish community wake up and see who this person truly is.